Listen up and pay attention. I have some words of wisdom to impart to you regarding “the next big thing”, which should bear some resemblance to previous attempts that you all seem to have ignored on your way to smartwatch perfection. So the following is for you, Apple, Google, Samsung, LG, and all current makers of “wearables” that tell time digitally. 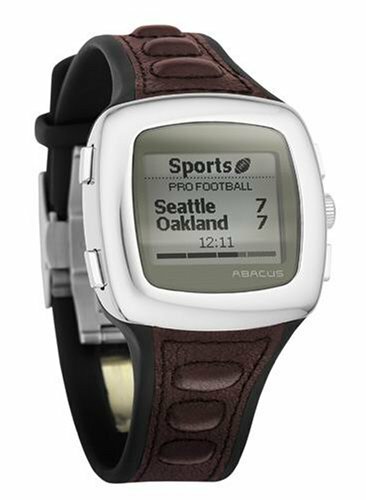 This is part of our smartwatch past. Remember this one? It’s called an Abacus WristNet. There’s even a vintage Amazon page for it here. This was a marriage between Fossil and MSN Direct (which provided the data service to push important data DIRECTLY TO THE WATCH). No Bluetooth available and no phone connection required – and yet data was received by the watch. This is truly revolutionary stuff (#sarc). It had its own data plan, and you could get sports scores, weather, and even national news. It’s a good-looking watch. The monochrome display is nothing to write home about, but it does the job. You may ask, what is the point of mentioning vintage technology long abandoned as a commercial failure? Good question. The answer is that this ancient attempt nails many of the features today’s smartwatches should have to be truly useful to the average person.